On October 15, Jesse Sternberg’s life was changed dramatically. He was a passenger in a terrible car accident which caused him to become a quadriplegic. Though we can’t take away his pain or frustration, there is one area where we can help, and that is financially. After a few weeks at the ICU in Peoria, IL, Jesse was transferred to Northwestern ICU in Chicago, IL. He has overcome several battles with pneumonia, various setbacks and days of pain, but he has never given up and has kept fighting. Now at Rehabilitation Institute of Chicago (RIC) Jesse has been able to lift one arm two to three inches, control a motorized wheelchair with that arm, and his voice is slowly recovering. He has a long and difficult road ahead of him. Jesse’s family will incur many expenses that are not covered by insurance. He will need home modifications (>$50,000), a transport vehicle (>$40,000), an automatic turning bed ($25,000) and possible treatment at an out of town facility. To help with these costs, a fundraising campaign in Jesse’s honor has been established with HelpHOPELive, a highly-regarded nonprofit organization that has been in existence for 30 years. All contributions are tax-deductible, are held by HelpHOPELive in the North-Central Spinal Cord Injury Fund, and are administered for Jesse’s injury-related expenses only. Thank you very much for your generosity, your emotional support and your prayers during Jesse’s recovery and rehabilitation. Together we can help him fight to regain his life. I guess time flies when you’re not having fun too! Given the comments we’ve heard lately, it was time we did another post to bring everyone up-to-date and dispel a few myths. Things are far from “normal” and that’s one of the many things that upsets Jesse. The fact is there have been no posts because we are all so busy trying to care for and support Jesse as well as do our jobs, work on his therapy and treatment options, take care of the house, pay bills and do all the other things that keep us all so busy these days. Jesse has continued to amaze everyone at his rehab clinic with his ability to work so hard in therapy, with how fast he catches on and does things and with his pure athleticism. He continues to build up his core and his arms/shoulders. That said, he still has a long way to go (sometimes it feels like it is too long for him) to get to the point where he can do almost everything himself instead of being dependent on others for most all of his activities of daily living. He hates that and who could blame him? “Things must be getting easier” – not really. True, we’ve learned how to do certain things better, but as far as his injury and his recovery, things really are not getting easier. Possibly the opposite as it has already been over 2 years and his recovery still has so long to go. So the passing of time just builds anxiety and stress as any recovery from spinal cord injury takes a long time and Jesse is part of the immediate gratification generation, not a good mix. Referrals for a live-in helper for Monday through Friday. He really wants someone closer to his age that he can connect with and enjoy working with on his recovery. Male or Female, good English skills, and most importantly closer to his age than his parents’. Keep spreading the word. We want to thank everyone again for your generosity and support. But he’s still millions short of what he is going to need over the next 10 years. So please feel free to forward this update to anyone and everyone in your contacts. We are trying to use what little money he has in his medical care fund for new treatments and bringing him wherever we need to for any treatment that can bring back his hands and sensation. Final words: Jeff Sebert of Sebert Landscaping and Great Impressions Landscaping is not only a great businessman, but he’s a great humanitarian. His company is currently building Jesse a backyard oasis. A place where he can spend time outside with friends, do archery, build bon fires, hit the hot tub and play games. We will post pictures and a more formal thank you on the web site once it’s done, but we had to mention it here since it is happening right now and the gift he’s giving Jesse is nothing short of amazing. Thank you Jeff, Stephen, Lou and everyone working on the project, we can’t thank you enough! Final words 2: We have a lot of other people to thank and a lot of other people who have made a difference in our lives and Jesse’s. We have a long way to go and we know that if Jesse keeps pushing, eventually he will get enough recovery to be happy again. We love you all and will try to do these posts more often. Thank you for your support. He’s home – finally! 7 hospitals, 12 months, thousands of miles of travel and we finally got him home 4 days before the anniversary of his accident. Our lives are busier than ever, as we are now doing everything we were doing before, plus doing all the things the nurses and assistants did when he was at the different hospitals and facilities. The good news is he’s home. No more nurses coming in to take his vitals every few hours, no one waking him up for medicines, room cleaning, food delivery, etc. A hospital is no place to get any rest! His dogs are with him, he has just started to have friends come over to hang out with him, and although all of these things have their downsides, overall I think Jesse is happier to be home than at a hospital. Our primary goal is to get him out of pain and into a daily routine that keeps him busy, has him doing several hours of rehab whether at home or at out-patient rehab and has him enjoying a little bit of each day. The house is still under construction, but Jesse continues to fight and impress us everyday. When he’s not in pain, he will still make jokes, come up with interesting conversation and want to do more things with more people. He has started to let people visit with him and he’s really appreciated everyone who has visited and just talked to him as they always would, not focusing on his injury or treating him special. The more “normal” we can make his “new normal” the better. The battle is still uphill, but we’re hoping we can get to the top soon. There are exciting new developments and procedures for spinal cord injury with the promise of stem cells repairing his injured spine still several years away. We are going to do everything we can to get him any/every treatment he qualifies for. The focus is to get his hands and wrists functioning. It may take the next year or two, but nothing is more important to his quality of life than regaining control of his hands and to some extent his wrists as well. Please understand that we greatly appreciate all of you and we wish we could communicate better with everyone on a daily basis. Thank you very much – from all 4 of us – for all of your support. We are going to continue to look for both financial and volunteer support as we explore these new treatment options for Jesse. His Triceps are Moving! Others told him he didn’t have them and would not get them back, KKI used electronic stimulation with physical therapy and within 3 weeks he has his tricep muscles coming back and he can feel them when they use the e-stim on them! He’s Getting His Trach Out! Met with the ENT on July 7th and got the green light to start the 2 week process to getting the trach pulled. Had a seizure on June 30th – they never did figure out what it was – but he got to see the John Hopkins Hospital ER and got his Dad to fly out the next morning at 6am, so it wasn’t all bad. Can feel more in the fingers and torso, even his legs have some light feeling in them. All his health issues remain stable or improving, he’s gained 20 pounds since his arrival! He’s an inspiration to all the other patients in the gym. Picture Jesse having to exercise on his side because of his still-healing wounds, and yet he pushes himself so hard that people notice and want to do more themselves. So maybe everyone’s prayers are finally being answered or maybe Jesse’s bad luck finally ran out or maybe he’s just a warrior or probably it is some combination of all of the above, but whatever it is, please keep doing what you’re doing and telling others about Jesse. Jesse really took a journey this past week. He physically journeyed to Baltimore and the Kennedy Krieger Institute. On Thursday the 12th an amazing organization called Grace on Wings (graceonwings.org) offered to take Jesse to Baltimore on one of their two specially built air ambulances. They donated the plane, crew and made all of the arrangements. They were amazing. (There was still a significant cost for fuel, etc. and we have a special thank you to Grandma Lee and Grandpa Mort for paying those costs for Jesse.) The founder and pilot, Hal Block, weaved the small twin engine plane through thunderstorms, missing every bit of turbulence and rain, to land us like a butterfly in Baltimore. Jesse was then driven by ambulance to Kennedy Krieger Institute where they were ready and waiting for him. Since Jesse arrived, the attentiveness, professionalism, compassion, knowledge and care provided by the nursing and doctor staff has been nothing short of amazing. We feel very fortunate and blessed to be here. There was a mishap with Jesse’s tracheostomy while he was being turned and he was in terrible pain, 3 hours later he was back at therapy. He is so determined to recover. KKI is treating Jesse’s wounds with electronic stimulation and between Friday and today it has already shrunk 10%. They have the latest equipment in every phase of his treatment and a staff that takes great pride in providing the best care possible. Last night David and Jesse spent 4 hours with Patrick Rummerfield. If you don’t know who Pat is, check out his web site at www.rummerfield.com. Pat has taken Jesse under his impressive wing ever since the first day he heard about Jesse’s accident and is the main reason we are here at KKI. If Jesse can achieve what Pat has achieved, he will truly have his life back. It was an awesome night talking with a truly amazing person who gave Jesse lots of reasons to be encouraged and inspired. Pat and the people from Grace on Wings are the kind of caring, giving, altruistic people that restore your faith in mankind! Look for another update soon about that. Jesse is currently at Holy Family Long-Term Acute Care Hospital in Des Plaines, IL – while here the last 5 weeks his wounds have greatly improved and he has gotten much stronger. He is eating a little more than before, but not full meals yet. He can now twitch his fingers on demand, only small twitches at this point, but it shows there is some nerve activity going on. We are hoping with the right treatment and physical therapy that a lot more movement and sensation comes back. He clearly needs more function than what he has now to live a fulfilling, happy life, so the real good news is that he has been approved, and accepted, to go to Kennedy Kreiger Institute in Baltimore, Maryland. KKI is led by Dr. John McDonald, the doctor who cared for Christopher Reeves as well as Patrick Rummerfield, the world’s first fully recovered quadriplegic. (Pat is also one of Jesse’s advocates and mentors, talk about having a great person in your corner, I didn’t even have to ask, he just stepped up to help Jesse because he’s that kind of amazing person.) Dr. McDonald invented the functional electronic stimulation exercise equipment being used by leading rehab centers around the world and at KKI they will use it extensively to give Jesse the most intensive physical therapy available anywhere. We are so grateful to all the people who have helped us get Jesse accepted and approved. We are also equally indebted to and appreciative to all of you who have donated your money and/or time to helping us with Jesse. We are truly appreciative of all the people who have helped us in every way and although we have to continue to keep our hands out because his needs are so great, that should in no way indicate that we are anything less than grateful, appreciate and honored by all those who have helped and will help in the future. Jesse continues his long and twisting path to recovery. He is currently at Presence Holy Family Hospital in Des Plaines. Holy Family is now a long-term acute care hospital. He is there to work on healing those pressure ulcers, getting strong and healthy enough to have the “trach” removed and do more therapy. Unfortunately, while working on health concerns, he is not doing a lot of therapy and his recovery is delayed as these concerns are addressed. However, his desire to look to the future has improved. Jesse’s interest in sports has perked up again as he has watched the Bulls (boo) and the Hawks (yeah!) again. He is enjoying seeing pictures of family and friends. Feel free to send some over via email to Sheri, Sara or Elana. He has passed the swallow test and is beginning to eat real food. Of course, we are all willing to bring him anything his heart desires, although his appetite is not quite up to speed yet. These are baby steps (with a few steps backward), but overall he has moved forward. Thank you all for your concern and support in getting him this far. Much more to come! Thank you to all who have contributed to HelpHOPELive in honor of Jesse. Your spiritual and financial support is really helpful to the family. Jesse and family continue along the long, bumpy road. While healing from the surgery, Jesse has had several cases of pneumonia, bad reactions to some medications and naturally, some frustration. However, he has also had more movement in his arms and twitching in his thumbs (which usually leads to more movement.) He can bring his right hand up to his chin. With the assistance of some arm support, Jesse was able to paint a picture. He always had artistic abilities and the picture is quite impressive. Jesse’s voice is also making a comeback. When he has full air coming through the pipe, his voice is clear and fully understandable. Physically he is making progress. Speaking of physical, Jesse is currently at Alexian Bros. Medical Center where he is being treated for his recent bout of pneumonia and the MRSA virus. This facility is close to their home and makes that part of life easier for Kathy and David, as well as for other family members to visit and support. We look forward to telling you of more progress…and while it is slow in coming, he is inching forward. Since the surgery Jesse is in lots of pain, recovering well at the surgical site. Jesse is getting his fight back, so these are great signs. He’s being transferred to RIC today. With our collective prayers answered, we hope he has good health and a great rehab moving forward. Your donations and support are helping keep him motivated in the right direction. 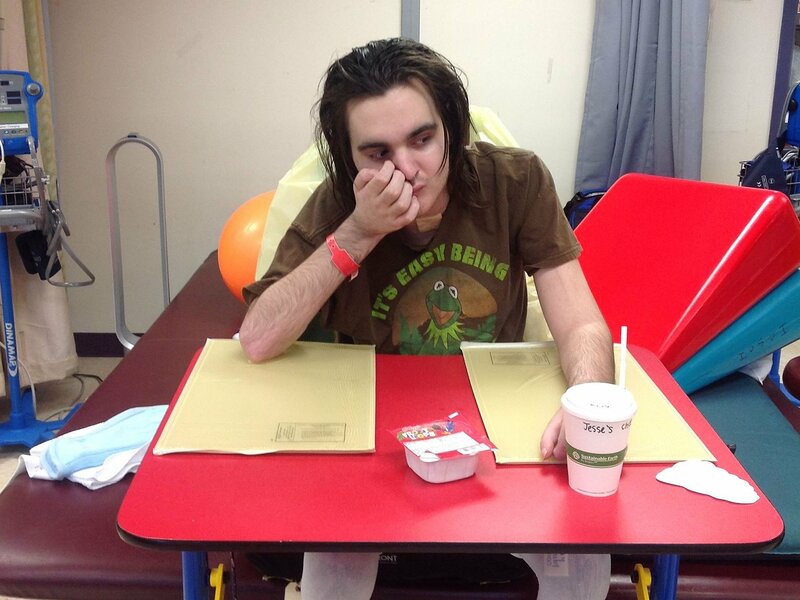 On 12-31-13 Jesse underwent an 8-hour surgery! The doctors cut into his stomach and hip to help repair and patch his esophagus and neck. The neurosurgeon removed the metal plate that was installed in his first surgery. The doctors removed the large abscess in his throat as best they could. Over the past 10 weeks, this young man has gone through several surgeries, had various infections and is now looking at another long recovery time just to get back to rehab. While the next 6 – 8 weeks will be very tough for him, we are hoping that this will help his recovery in the long term. Thank you for your collective prayers and best wishes for him . We need everyone’s support for when he recovers from this newest challenge. What a champion you are Jesse! So wonderful to hear the latest news and the feeling you are getting back. We continue to pray and think of you. Such hard work you are putting in but it is really paying off! Keep on keeping on! Congratulations Jesse on being accepted to the Kennedy Kreiger Institute in Baltimore, Maryland! I know you are going to make HUGE strides in physical therapy there. We are all pulling for you Jesse - keep on getting better! YOU ROCK! We are saddened to hear of your car accident..We are praying for you and will send a gift of currency..Stay calm stay focused, Moses split the sea and Jesus walked on water..love to you, We are Lincoln Prairie..Liza Ohman..Nick De Filippis..Damiane Velez..Pilar Santilli..
Hi Jesse - we are cheering you on. Please stay strong and know that so many people are behind you. You are doing amazing! Jesse, please don't ever quit fighting back. Your strong will and determination are a true testament to who you really are. I know you will continue to beat the odds, even on those crappy days, and make everyone believe that MIRACLES DO HAPPEN! All our love and support to help you get through this and we believe you will have a fulfilling life ahead of you. Jesse we are pulling for you to get better so we can go fishing soon !! Mitchell Mages & Friends ….